In the tenth chapter of the Gakudôyôjinshû, Dogen Zenji says that there are two ways to define oneself in body and mind. One is to delve into and explore zazen, the other is to meet a teacher and listen to the dharma. Both, Dogen says, are essential for reaching the way. At this point of the "adult practice" series, I am still concentratin on the aspect of exploring zazen. I want to continue to write about the hips in the summer. We will also investigate the hands, eyes and the role of the mind during zazen later. After that, I want to write a couple of articles about studying with a teacher. But before I continue with the series, I want to address the question which serves as the title of this article: What does it take to become a full-fledged Soto-shu priest and is it really worth the whole deal? The question of course relates to the topic of meeting a teacher and studying in a sangha, in this case not only eager dharma brothers that share our daily practice, but also a complex organization with a fixed structure and a huge bureaucratic apparatus, called Japanese Soto-shu. Requirements differ from teacher to teacher, but on the material side you need the whole outfit (inner and outer robes, belts, o-kesa, rakusu, kechimyaku (transmission chart) and eating bowls), which can be quite expensive and/or time-consuming to make (at Antaiji, you write your own kechimyaku, while the rakusu and o-kesa are donated. The rest you have to buy). You also need to be willing to take the precepts, although no-one here in Japan expects you to keep to their letter. Actually, at Antaiji most ordination ceremonies are followed by a party that involves drinking, although abstaining from alcohol is part of the precepts. The whole ceremony consists of first receiving the materials and then taking the precepts. It takes about an hour, there is lots of chanting and dozens of prostrations for the ordinaiee to be made. You need to make a photograph or two as proof during the ordeal, otherwise it will not be recognized by the Soto-shu headquarters. You send in the photograph with a form with your name on it (both lay name and ordination name consisting of two Chinese characters) and a copy of your passport. The registration fee is 2000 Yen. The form also needs to be signed by the teacher, who has to be an authorized temple priest. After a month or so, you receive an official document from the headquarters that recognizes you as a Soto monk in training, together with a small handbook that is supposed to introduce you to your vocation (it is called shuryo-hikkei and I quote from it in my article for the Antaiji yearbook 2004. Congratulations! You are now officially ranked as a joza in the Soto hierarchy. Joza is sometimes translated literally but misleadingly as the "top seat", but more realistically it is simply one who has "climbed a seat". "Top seat" is the original meaning, and the joza is used to translate the theravada (lit. "elder") in theravada buddhism (Jap. joza-bukkyo), for example. In old India, it referred to monks who had been practicing for at least 10 or 20 years. In old China, the joza used to be what is the shuso (see below) is in Japan today - the leader of the training monks. In fact, as you are the last one to be ordained into the commmunity, when you become a joza today in Japan you will sit on the bottom seat. Sorry. The only rank below that of joza is the shami, which stems from Sanskrit zraamaNerikaa and means "novice monk who has taken the precepts". Today in Soto-shu, kids below the age of 10 who take the precepts are called shami, everyone else (even an eleven year old who is ordained) is a joza. So, as a matter of fact, the people who are in reality only novices (shami) are called "elders" (joza), while a real elder or head monk is called shuso and has the rank of zagen (see below). I have ordained twelve people so far. Only one of them lives in Antaiji right now. Some of the others have their own Zen dojos in their home-contries, others have gone to train at other temples, or live secular lives again. From some I have not heard in years. That is Ok with me. Whoever ordains at Antaiji should, if possible, stay for a longer stretch of time, but if it is not possible, because people have other responsibilities for example, that is no problem for me. The only question is: What meaning does it have to be a Zen monk and not live in a Zen monastery? Whenever people ask me this question, I answer: It depends on you, you have to give meaning to your monkhood. Either you do, or you do not. You can live in your apartment and have your kesa sitting somewhere on a shelf, collecting dust, or you give meaning to your being a monk through the way you live in daily life. But there is no fixed answer, you have to find your own. In practice though, it can lead to problems, especially when people realize that Soto-shu will cross them off their lists after 10 or 20 years or so (see below). So as the present policy at Antaiji is that you have to stay either less than 100 days or more than three years, I would like to say: If you want to ordain as a monk, why not invest three years first at Antaiji? In Confucius' life, standing firm at age 30 is the second step. One could see a parallel to risshin here, the second step in the carrier of a monk ("heart set on learing" being the first step for a monk as well). It took Confucius 15 years. During the Tokugawa period (1600-1868) you needed to have at least 20 years of practice as a monk under your belt to be the shuso (head monk) and do risshin. Today, you have to be at least 20 years old or you have to be at least 16 years old and been a monk for a minimum of 3 years. I.e., if you ordain at age 13, you can be shuso at age 16 (at least in theory, although it actually happens that a father who at the same time functions as his sons "zen master" lets his son be the shuso while he is still in high school). But, if you ordain after the age of 40 and do not take this step within the next 10 years, Sotoshu will erase your name from its register. If you are under 40 at the time of your ordination, you have a maximum of 20 years to do risshin and perform the dharma combat ceremony. That means that if you receive the title of joza but do not live up to it (in the eyes of the headquarters), they will promptly remove it again. If you ordain, Sotoshu expects you to act as the head monk and be the officially registered leader for a practice period during the first one or two decades of your practice. What is the meaning of risshin? The literal meaning is: "To raise one's body into a standing position". This is what children learn as toddlers. When still babies, they where first crawling on the floor, then walking on all fours. Eventually they learn to pull themselves up and climb on chairs and tables, they can stand and walk by themselves, and finally they get better and better at expressing themselves verbally as well. They learn to share the perspective of the "big ones". They become recognizable as human beings, they are no longer the content of a crip in the corner of the room. With a monk's risshin, it is quite similar. It means to gain physical stability. Confidence in oneself and one's role as a monk. The ability to express oneself and share a wider perspective, not restricted to one's own needs only. He starts to function like a pillar that supports the sangha. Maybe the reason why the physical presence, the attitude and the voice of the monk who preforms the dharma combat ceremony are so much emphasized, while the actual content of what is said is of secondary importance, has to do with the literal, physical meaning of "standing firm". What exactly does the dharma combat ceremony consist of, that accompanies risshin? As the name says, it is more of a ceremony than an actual "dharma combat". It lasts about an hour and the main part of it is an exchange of questions and answers between the members of the sangha and the head monk. This exchange is usually rehearsed in advance. The ceremony highlights a three month practice period, during which the person in charge serves the community as the head monk. He or she will not necessarily be the oldest or most experienced in the sangha. Still, it will be the person's job to act as a leader and be able to replace the teacher during his absence, or give dharma talks in the teacher's place. The first instance of a head monk (shuso in Japanese) in Japan is Ejo in Koshoji. It is documented in the fifth chapter of the forth book of the Shobogenzo Zuimonki. In the video below, you can see a small portion of the first such ceremony that was performed at Antaiji after I became the abbot (10:05 - 10:40). The shuso is a monk from Poland who ordained in a different temple. Soto-shu expects you to receive dharma transmission (shiho, see below) from the same teacher you ordained with (the ordination teacher is called jugoshi, while after dharma transmission he will be your honshi, so you can not have different jugoshi and honshi). It is possible to switch teachers though, if both your old and your new teacher give permission. In this case, the new teacher will be your new jigoshi. If you can not get the permission to switch teachers from your old teacher, you will have to re-ordain with your new teacher. Only in the case of the dharma combat ceremony, it is possible to do it with a teacher different from you ordination master (the teacher you do risshin and hossenshiki with is called hodoshi, because of the hodo (dharma-pole) that is usually erected during shinzanshiki (see below) as a sign that the teacher is from now on preaching the dharma). In most cases, a monk will perform the dharma combat ceremony at a small parish temple close to his teachers temple, when the resident priest of that temple performs the "mountain ascending ceremony" (shinzanshiki, see below). 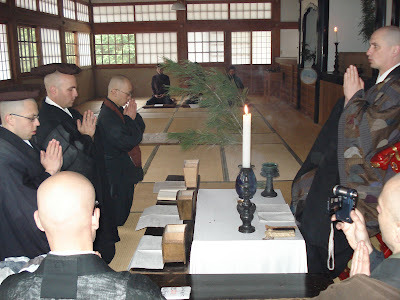 Other monks become the shuso when they train at a formal training monastery (sodo, see below) for a couple of years. In my case, I performed the ceremony at the temple of a senior dharma brother of mine, when he became the resident priest at his own temple and performed the "mountain ascending ceremony". In a case like this, the shuso usually does not spend the whole 3 months of the retreat at the temple, as the temple is not a traing temple but a parish temple in the first place, i.e. there is no functioning sangha of training monks. This is the case for 99% of Soto temples in Japan. That means that I lived and trained all the time in Antaiji and only went to my dharma brothers place for about a week or so with a group of my fellows from Antaiji. When you are the shuso at a regular sodo though, you will have the position for the whole practice period and also enjoy certain privileges (entering the bath before everyone else, sitting next to the roshi) and extra duties (running with the wake-up bell every morning, cleaning the toilets, having no days off etc.). In some sodos like Eiheiji for example, it is extremely difficult to become the head monk. Other places seem to be desperate to find a candidate. I had a Japanese student who ran away from Antaiji because he could not handle the practice, but when I introduced him to a country side sodo not far from Eiheiji, he was given the position of the shuso right away. In Antaiji of course, it is also possible to perform hossenshiki as a head monk. Some people think that only at a regular sodo an abbot can perform the hossenshiki multiple times, while at a parish temple it is possible only once, at the time of the "mountain ascending ceremony". This is false, although it is true that in practice most parish temple priests perform the ceremony only once, while a sodo does it twice each year, once during each ango (practice period of 3 months, usually held in spring/summer and autumn/winter). In fact, any temple can perform the ceremony as often as twice a year, it is just never done. This is because of the lack of a sangha at most temples. Without a functioning sangha, it is very complicated and costly to organize the ceremony (and the whole practice period, which only takes place on paper of course). How long it takes until you are asked to be the shuso at Antaiji depends mostly on your practice, the amount of responsibility you are able to shoulder, the leadership you can show. In most cases so far, people had been monks at Antaiji for at least 30 months (2 and a half years), sometimes even up to six or seven years before they became the shuso. The fees for Soto-shu are about 20.000 Yen, but often the senior priests that attend the ceremony need to be paid as well. Therefore, depending on where the ceremony is performed, it can be quite expensive. I have heard of monks paying up to 1.000.000 Yen (one million Yen, i.e. 10.000 US dollars) for the whole thing. The calculation usually runs like this: You have a dozen or so of big guys sitting in the front row with their fancy kesas on. They need to get 500 dollars pocket money. The resident priest who functions as the hossenshiki master gets another one or two grant. After that, travel expenses and food catering need to be covered. Often, they ask you to appear in a brand new kesa and koromo, which also cost money. In the end, 10.000 dollars might not be enough! At a place like Antaiji though, as everyone participating does so as part of their practice, nothing but the Soto-shu fees need to be covered. While in the case of ordination, it is usually the student who asks the teacher to be allowed to ordain as a monk, it would be very strange if a monk asked to be made the shuso in a temple and be allowed to perform hossenshiki on his own initiative. It has to be the priest who asks the monk to be his shuso for one practice period. If you are asked to do so, you might want to check how much money you will be charged later (on the other hand, that question might be considered very impolite!). Hossenshiki is practiced only in Soto, it is unheard of in Rinzai-zen. Several months before the practice period starts, you and your teacher have to apply to the headquarters for permission of the practice period to take place (there are several conditions, one of them being the presence of a shike, a high ranking roshi). After you complete the 3 month practice period, a form signed by you and the teacher will be sent to the headquarters in Tokyo. This time you get no certificate back, but you are now officialy promoted to the rank of zagen, which is (really) something like the "top seat", or more literally the "base seat/seat base". and the obligatory training period in an official Soto priest seminary (sodo ango) for at least one year (if you graduated from colloge, otherwise longer). In the next article, let us invest what the third step, shiho, is all about. Does dharma transmission make you a Zen master? How does it work, and how important is it? Is it really a transmission of dharma, or is it just a piece of paper that passes hands, a formality? Finally, after covering all of the steps in the carrier of an aspiring Soto-shu priest, the question will be: What function does all this ceremonial stuff serve? Why should anyone want to do it? Is there any meaning to it, or should we rather do without?